Welcome to magnificent Franconian Switzerland. The region is known for its varied landscape with cliffs, forests and centuries old stalactite caves. 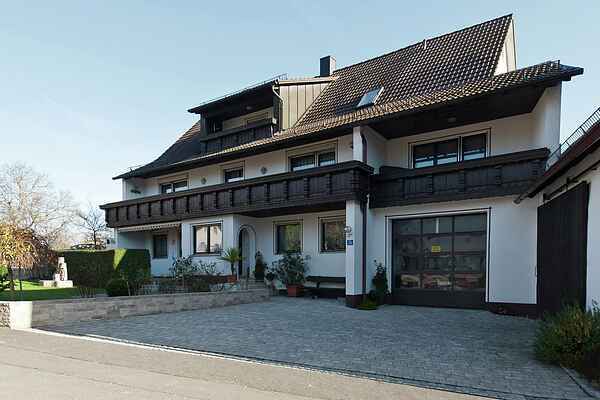 This is where the small village of Morschreuth is located, and you'll stay in this beautiful apartment in a quiet area on the outskirts of town. This very large apartment is spread out over both upper floors of the house and therefore offers two complete living units. It is ideal for larger groups or multiple families, acquaintances and friends. The self-contained apartment is fully furnished and offers plenty of space. Balcony, terrace, barbecue area, and parking spaces are all at your disposal. While you enjoy peaceful moments in the garden equipped with outdoor furniture and loungers, your children can play to their hearts' content. You're also welcome to make use of the sunbathing lawn. Bread roll service is available. Nearby you'll find restaurants, miniature golf, tennis court, golf course, summer toboggan run, rock climbing wall, boat rentals, horseback riding and much more. You can discover the attractive and varied area on the many kilometres of well marked hiking trails that start right on your doorstep. Popular excursions: Gößweinstein (7km), Ebermannstadt (8km), Mottenstein (12km), Pegnitz (20m) and Bamberg (50km).